To anyone who has run smack into an unyielding bureaucracy, spent half a lifetime on hold, or was run ragged to obtain the required stamp on a form, the hero of the film “I, Daniel Blake” will seem painfully familiar. He is all of us. When we meet Blake (Dave Johns), he is suffering an interview assessing his fitness to return to work after recovering from a heart attack. He cannot receive disability benefits without a medical authorization; he cannot have his medical authorization validated without a certain form. He cannot get that form without proving he has looked for work. He cannot look for work while recovering from a heart attack, etc, etc. The labyrinth of civil service forms (made worse by his own computer illiteracy) leaves Blake marooned, and his only hope is a dispensation from an unseen “decision-maker,” which never seems to come. What’s a carpenter nearing, but not quite at, retirement age to do? Aghast at the dunderheadedness of paper-shufflers at the local welfare office, Blake cannot suffer the fools there, but the alternative is to be “sanctioned” -- blacklisted from potentially receiving any benefits for years. And the streets are filled with people who have been similarly demonized for a lack of gainful employment. “I, Daniel Blake,” which has its U.S. premiere today at the New York Film Festival, and which won top prize at this year’s Cannes Film Festival, is a masterful cry for human decency from director Ken Loach, a veteran of working class dramas and documentaries dating back to the 1960s. Loach’s 1969 “Kes,” about a young Yorkshire boy and his pet falcon, is a classic of youth and social-realism. His other films, including “My Name is Joe,” “Sweet Sixteen,” “Riff Raff” and “The Wind That Shakes the Barley,” dramatize the struggles of the working classes, the unemployed and the politically excluded. Daniel Blake is among their number. He is a man unused to waiting, it seems, though he has put in his time caring for his mentally-ill wife up until her death. His struggle would be wholly singular if not for the few people who enter his orbit. 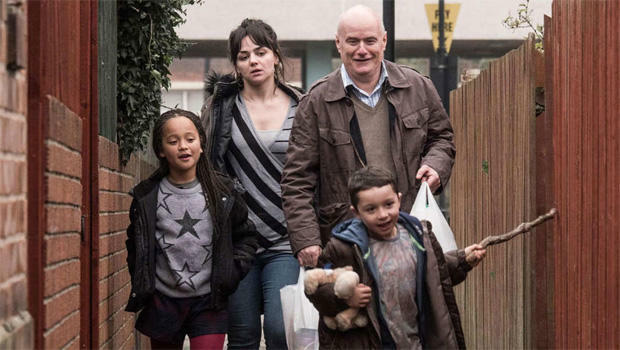 Kattie (Hayley Squires) is a single mother with two young children who has relocated from London to Newcastle on the promise of improved circumstances. But she is caught in an equally-bad bureaucratic morass. After the childless Blake takes her and her kids under his wing, it is only through his generosity that her squalid apartment becomes habitable. Kattie’s plight is even more perilous, if only because she tries to shield her kids, and Blake, from the terrible choices she is reduced to making, such as starving herself just so that her children will have something to eat. Finding his life on hold, Blake may seek relief by helping others. Would his good karma somehow wind around back toward himself? We don’t get a sense that that is his expectation; rather, helping out however he can is just the thing to do. Loach’s capacity for empathy is without question. Even when he takes a dispassionate tone in his staging and camerawork, his film’s message is that, in the face of dehumanizing social structures (as in a civil service office, a food bank or a police station), there are glimmers of compassion. When it appears unexpectedly (as in the case of a grocery store manager dealing with a shoplifter caught red-handed), it exemplifies how people have as much capacity to surprise and render aid as they do to turn away, shut their eyes, or otherwise tune out the cries for help from their fellow residents on this planet. It’s a choice. And “I, Daniel Blake” calls out, simply, those of us who fail to make the right choices. “I, Daniel Blake” (distributed by Sundance Selects) will be released in select theatres December 23. The film is not rated. To watch a trailer for “I, Daniel Blake,” click on the video player below.